I started my day with a shot of bright yellow Jamu. 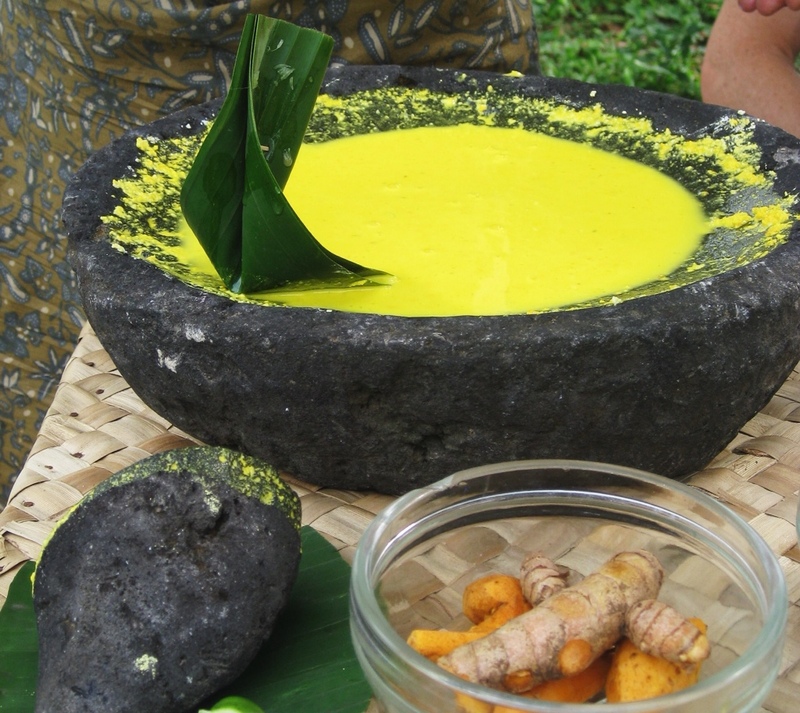 Jamu is the Balinese equivalent of a multi-vitamin and its ingredients can be adjusted depending on your ailments. The basic version is made from mashed turmeric root, kencur (an aromatic ginger root), rice that has been soaked in water, and a little bit of sugar water for the faint of heart. It burns going down, but in that good way, like antiseptic on a cut, that makes you think you must be doing something really healthy for your body. We spent the morning hiking through a farm, and our host showed us multiple other medicinal leaves and plants that can be used as natural remedies for ailments. I learned that putting a slice of ginger on your head eases a headache, candlenuts can induce hair to grow, and turmeric can be used as an antiseptic as well as helping prevent Alzheimer’s. We also learned about many of the different ways the Balinese use palm fronds and banana leaves to make parcels for cooking and for religious ceremonies. 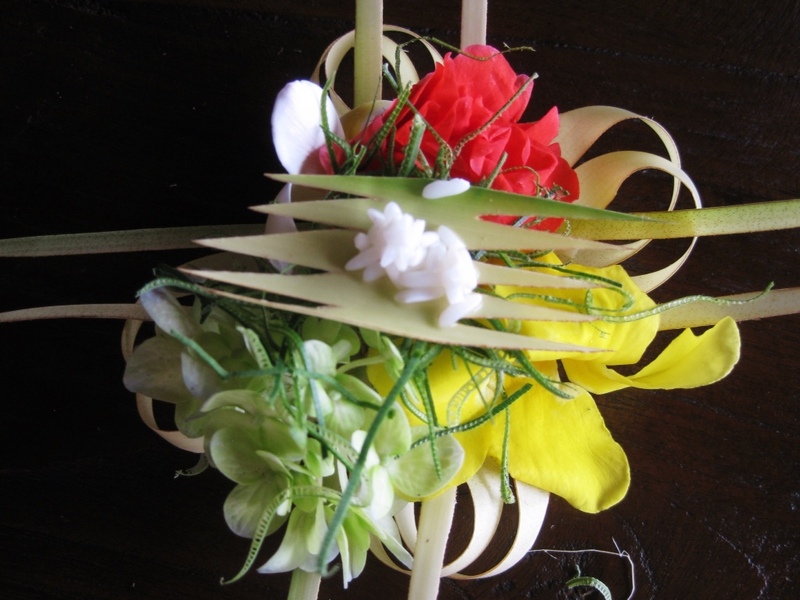 We tried our hand at the basic palm frond flower that is used every day in Balinese homes, morning and evening. I was very uncoordinated weaving the little basket together, but luckily I covered my handiwork with four beautiful flowers, each symbolizing a different Hindu god as well as some rice soaked in holy water. Everything we cooked today was especially delicious. 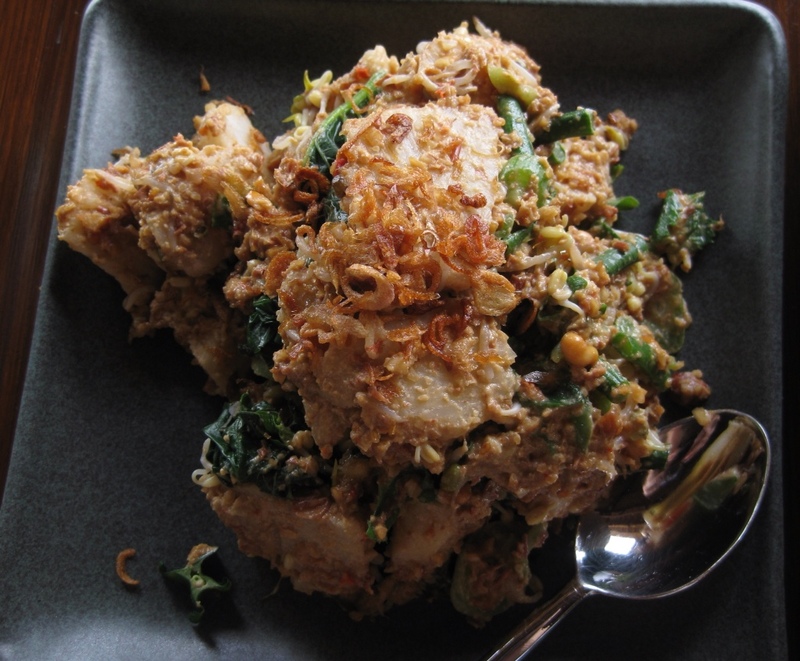 We started by making the standard Bumbu Bali, the spice mixture that goes in every dish. 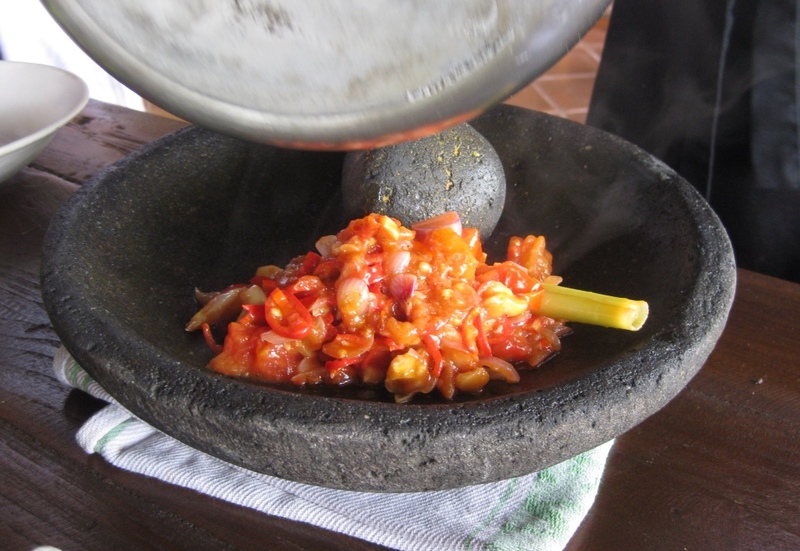 I learned that in bumbu, you grind the spices first and cook second, making a thick, chunky spice paste, whereas in the other Balinese form of seasoning, called sambal, you cook first and grind second, creating a smoother sauce that can be used as a condiment. We made two different sambals today to go with our dishes. The first was sambal tomat, or tomato sauce. This is a Balinese version of salsa and it’s delicious. We made it by cutting up tomatoes, garlic, shallot, candlenut, and chilies and cooking them with shrimp paste then finishing off the dish with palm sugar and lime. I learned that citrus is always put on at the end of cooking because otherwise the heat will diminish the flavor. 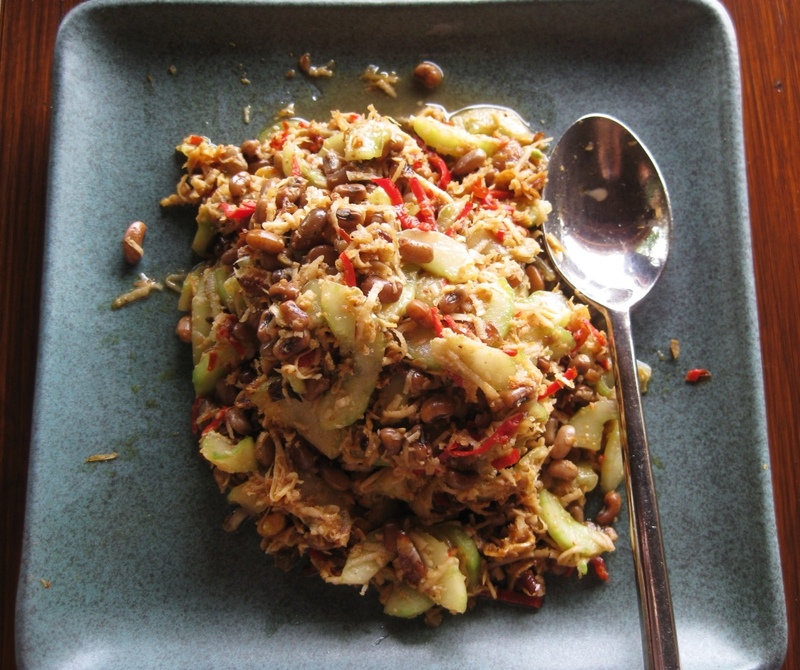 The second sambal was called matah, which means raw. 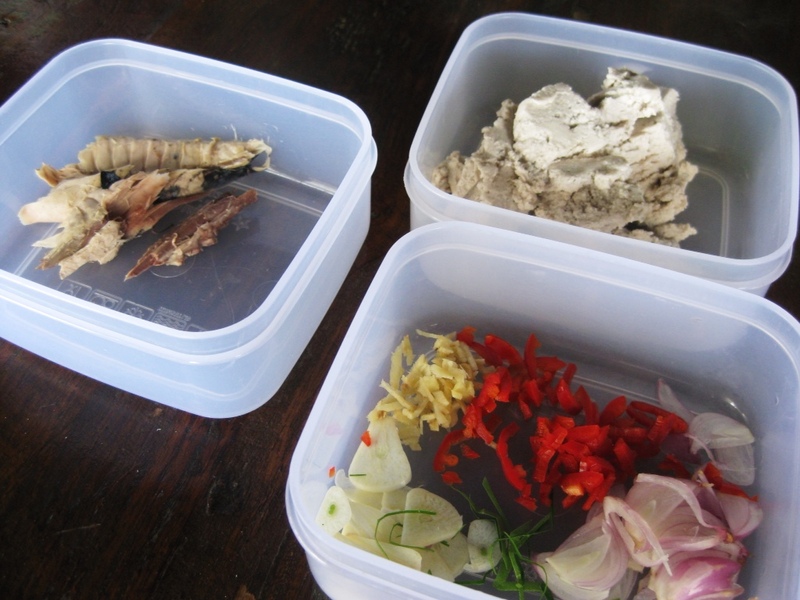 We minced up shallot, lemongrass, chili, ginger flower, and shrimp paste and added a dash of lime for a spicy flavor. 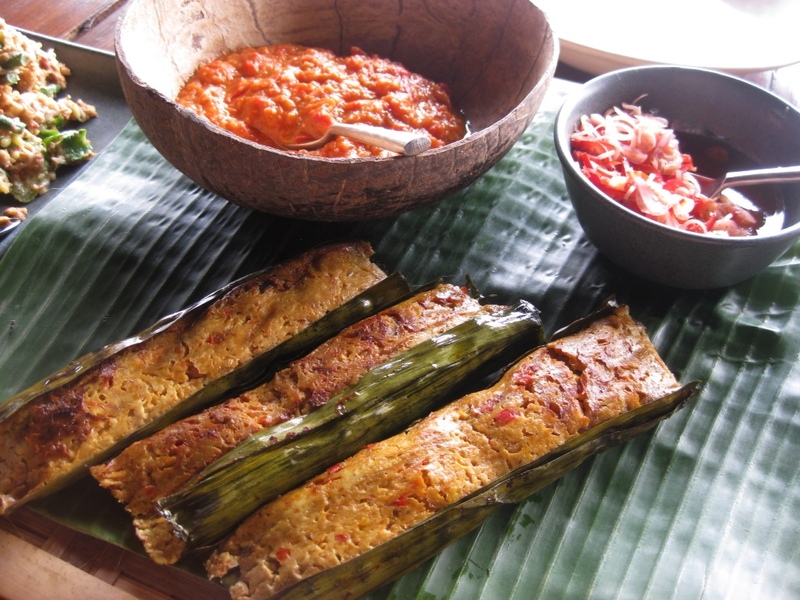 Next was pesan oong, which is a grilled banana leaf parcel filled with coconut curd and poached mackerel. Mackerel is the most common fish on the island and is typically poached in seawater. Coconut curd is what is leftover when you make fresh coconut oil – it is the remaining boiled milk once the oil has been filtered out. 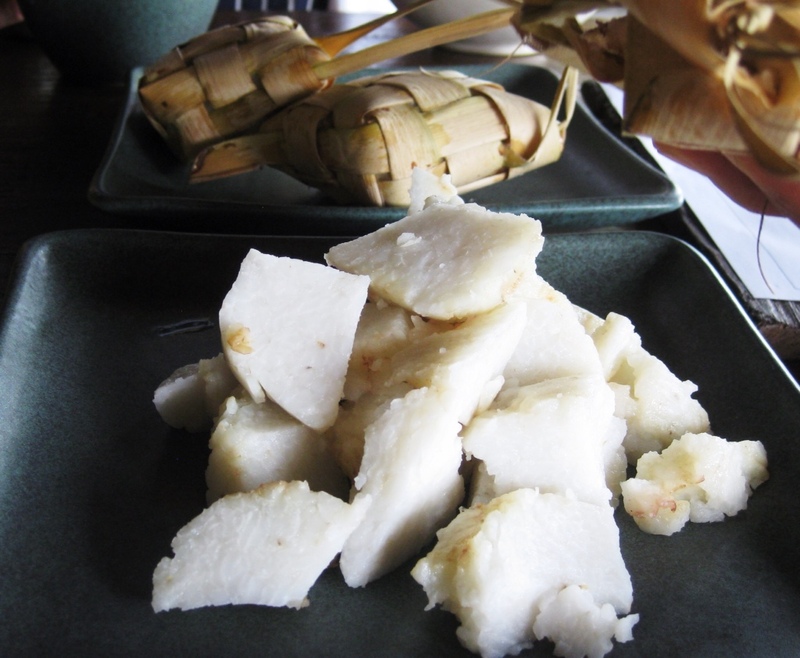 Although the taste of the fish was quite strong, the coconut balanced it out and it was flavorful and very good. After that we made urab ketimun kacang barak or cucumber and red bean salad with lime and coconut. 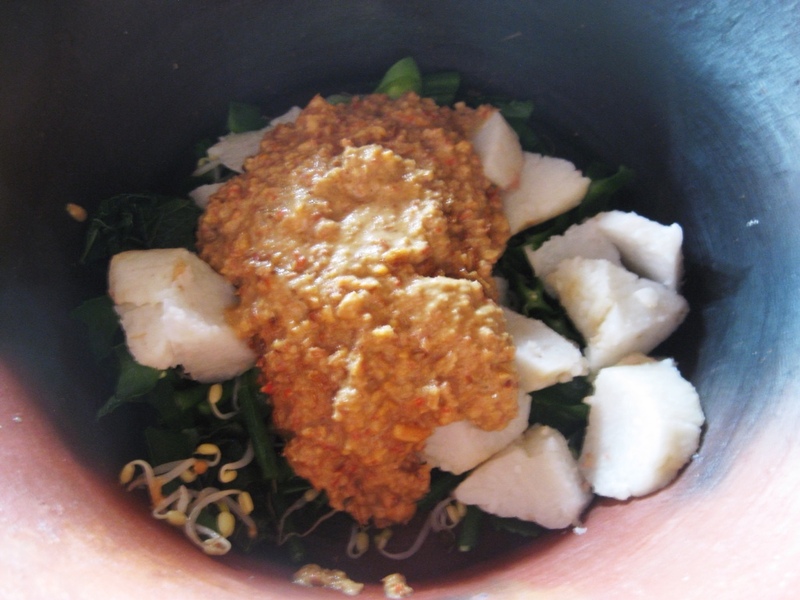 It was relatively simple to prepare by mixing the main ingredients with bumbu sauce and sambal goreng, a fried sambal made from shrimp paste and chili. The salad tasted fresh and healthy, with a nice touch of lime. 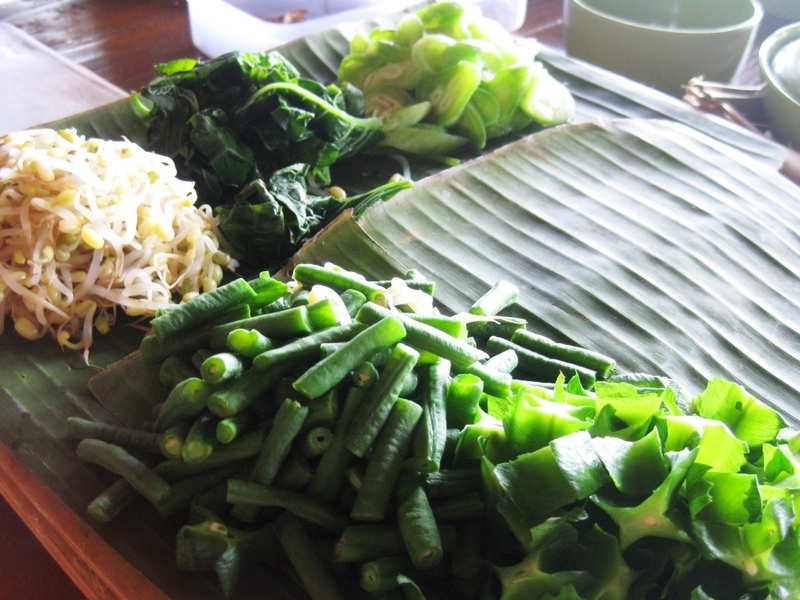 We saved the best main course for last: tipat sentok or steamed vegetables with rice cooked in a palm leaf baskets and tossed in peanut sauce. We made the peanut sauce the Balinese way, rather than the Indonesian way, which means that we didn’t cook the sauce once we had mashed it up, although each of the ingredients of peanuts, chilies, shallots, garlic, and ginger had been fried individually before they were combined into the sauce. The rice was made in one of the baskets we learned about this morning and is cooked for a few hours until the grains meld into each other and form a single chewy glutinous square. We cut up the rice and added in blanched greens for a delicious result. I think one of the reasons I liked it so much was that it did not have shrimp paste as an ingredient. 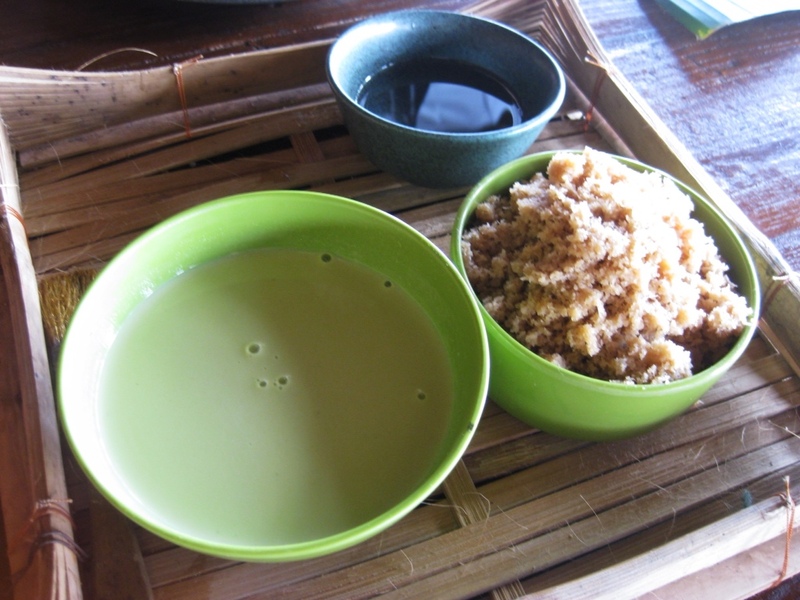 Shrimp paste is ubiquitous in Balinese and Indonesian cooking, and while I appreciate its distinctive flavor, it was also nice to have a break from it. 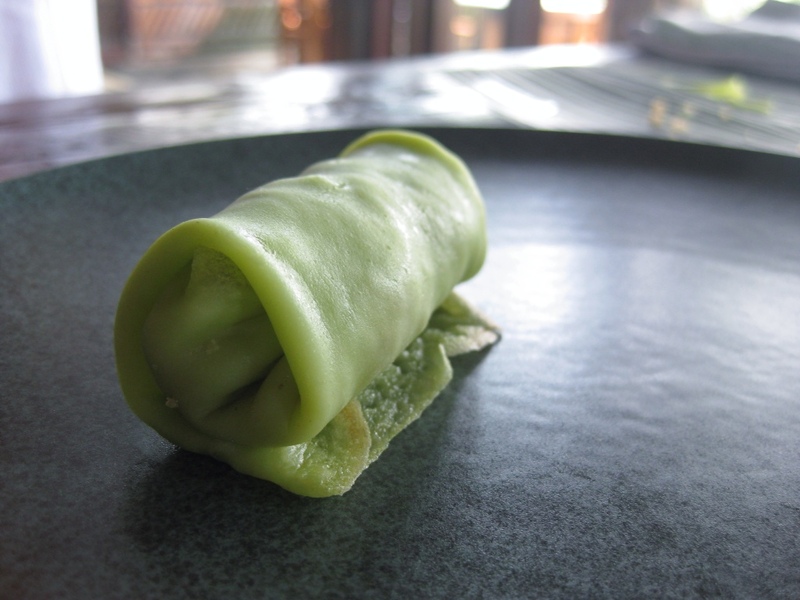 Dessert was dadar gulung or sweet green pancakes filled with fresh coconut and palm sugar. The name pretty much says it all – the pancakes were basically crepes that were naturally colored green from pandan leaves and the filling was freshly grated coconut drizzled with caramelized palm sugar syrup. They were light and delicious and not too sweet. It was fascinating to learn more about how the food, the religious offerings, and the culture link together. I found it especially interesting to hear about the myriad leaves and roots that have medicinal powers and to see how common that knowledge is here. It felt a bit like the porcini hunt in Italy, where there were so many mushrooms but a practiced eye could tell the poisonous from the benign. 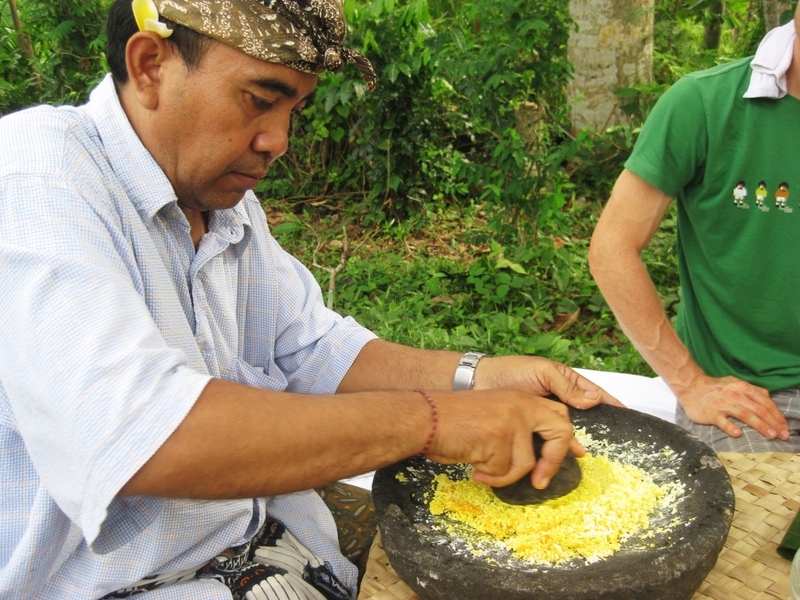 In Bali, the locals have mastered the hidden compounds of the abundant greenery nature has provided and continue to pass that knowledge down across generations. 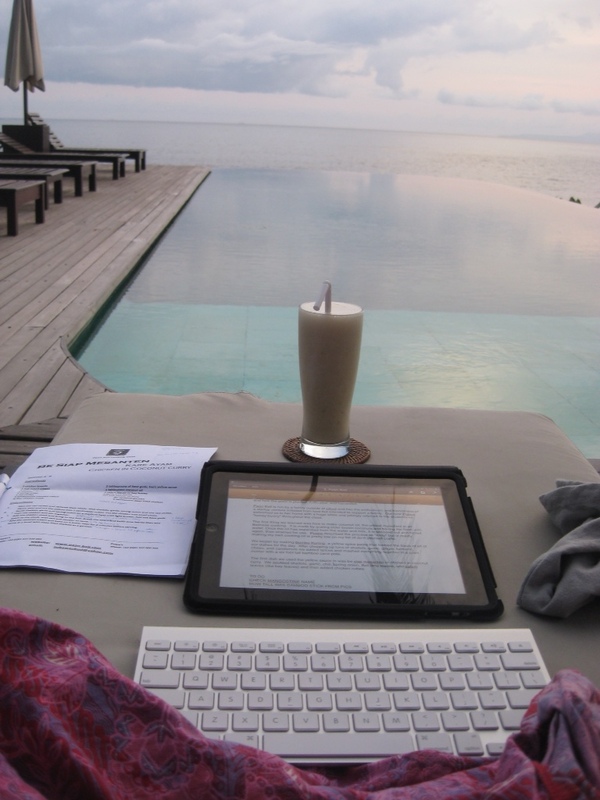 This entry was posted in Bali, Bali, Balinese, East Bali, Indonesia, Indonesian and tagged Bali, Bali Asli, Balinese, bumbu, cucumber red bean salad, dadar gulung, East Bali, fish in banana leaf, Indonesia, Indonesian, jamu, pancakes with coconut and palm sugar, pesan oong, sambal, Seraya Shores, tipat sentok, urab ketimun kacang barak. Bookmark the permalink.